The Old Town of Segovia and its Aqueduct is a historic town with an excellently preserved civil engineering work from the Roman period ca. 50 AD. The first historical reference to the town of Segovia dates back to the year 192 A.D., when its Celtiberian inhabitants were defeated by Roman forces. Segovia is world-renowned for the ship-like appearance it projects: the Alcázar standing at its bow, the cathedral tower being its mainmast and the aquaduct its helm. The aquaduct was probably erected in the first century A.D. It supplied water to the high-lying part of the town, at that time occupied by the Roman military headquarters and today the site of the Alcázar. It's an underground channel, with a free-standing arcade comprised of 20.000 granite blocks that are held together without any kind of binding agent or mortar. I enjoyed some wonderful days here. Segovia is a lovely town with a friendly atmosphere. Especially in the evenings when its inhabitants go for an evening stroll in the medieval streets. 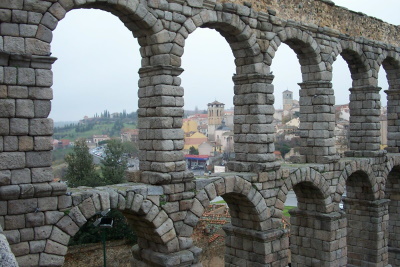 Segovia is most famous for its aquaduct. It's really huge, and remarkably complete. What you really shouldn't miss also is the Alcazar, the Castle. Situated at the top of a hill it has romantic quality. Inside the knights in armour await you. I found the Alcázar more impressive from the outside than from the inside. 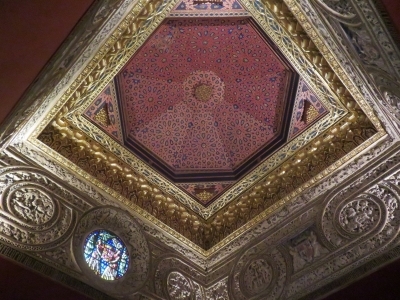 This may be partly because of the fire in the 19th century after which they replaced the interior by ceilings and furniture from many buildings from all over the country. The cathedral I found more and more appealing the longer I stayed inside but I think I have developed a certain weakness for this strange late Gothic style that they call the Isabelline Gothic and that I find very similar to the Manueline Gothic in Portugal. 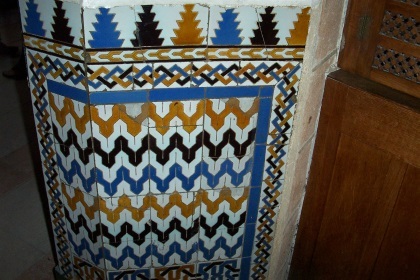 Its interesting curved lines seem to be inspired from plants and perhaps they even inspired Gaudì. With this style the lady who expelled all Jews and Muslims from Spain left at least one good thing of which the Spanish can still be proud. I also walked along the aqueduct up to the monastery of Saint Anthony which has very impressive mudejar ceilings. If you compare this aqueduct to other Roman aqueduct like the Pont du Gard it is constructed with much rougher stone blocks. Since I was on foot I didn’t get further along the aqueduct then the obvious aboveground section. The core zone however extends for many more kilometres and include the full length of its (partly disputable) course. If you have a car and some time for hiking you can follow its course all the way. In the Casa de Moneda museum that I will come back to you later I found several guides about the aqueduct and the places where you can see its course. They were all in Spanish only but seemed quite interesting and this WTS seems hardly completely appreciated without seeing these parts. Beyond those three highlights the old town is quite compact on a rocky hill. But there are not really many more outstanding buildings in the core zone. Most buildings in the old town seem quite new or so heavily renovated that you cannot tell their age. Often you see foundations or a door that seem old but it is hard to tell if the rest is removed or just hidden behind the new material. I felt this was quite similar in other old Spanish cities such as Toledo or Arvila. And this seems different to comparable cities in France or Italy where more historic substance is visible and I’m not quite sure what the reasons for this are. What they do have here though is a number of Romanesque churches. Many of them are quite impressive from the outside but most of them are closed and it’s often very hard even to find out if they are opening times. I found information for some but often vague and contradicting. Therefore my best guess was to look for times of service since they often open the churches half an hour earlier and this worked out quite a few times. It is a bit strange though that some of the most impressive Romanesque churches are not included in the core zone such as San Millán. I started my walk at the church of San Lorenzo, another very nice Romanesque church surrounded by half timbered houses like a charming village square. I came in the morning to see if I could get inside but the interior was quite altered. From there I walked north and saw by coincidence a sign about a path along the river or partly even on the river named El Sendo de los molinos, the mill path. The river is here quite strong and wild and in the early times of industrialisation they used it for several different kinds of mills, all in ruins now. The walk turned out to be absolutely enchanting since the water had shaped the rocks around and in the river bed to strange curvy, sometimes seal like shapes for which many a daimyo would have easily spent a fortune and carried them across half the country to put them in his garden. After this I walked to the monastery of San Vicente el Real. This is a rather simple building complex considering it’s royal name but obviously still in use and well-kept: Unfortunately it was closed and there was no sign of any touristic infrastructure. A little disappointed I walked back down the hill to the next monastery called Santa Maria el Parral. I had found out that they give tours at 11 am and at 5 pm so I certainly didn’t want to be late and miss it. At 11 o’clock I was the only person waiting when an elderly man stepped out of the door to the monastery and asked me if I was there for the tour. His question and the following tour were in Spanish, a bit of a challenge for me but I nodded a lot and managed to understand quite a bit. It got easier when after a while two Spanish couples joined the tour who were either by accident there or late. However, the moments when you enter the church is a total wow moment: This is supposedly the first church in this flamboyant style and has a huge altarpiece and similar tombs to each side. Curiously the arches along the churches single nave are in built in many different styles: Romanesque, Gothic, Arabic, Renaissance, flamboyant and even baroque! After the church we could only see a small part of the monastery but there was a fabulous view on the Alcázar and they keep swans and peacocks in some former cloisters! Right below this monastery is the Royal Mint built by Philip II. This building is sometimes defined as one of the oldest and best preserved industrial buildings in Europe or even as the worlds’ oldest industrial building! In any case it seems that the building itself is quite original and everything made of stone well preserved while all the wooden tools are naturally lost and now reconstructed since the building served in the 20th century as a flower factory! As often in Spain they provide an excellent though sometimes lengthy audio guide that gives a lots of information about the history of money, minting and the specific history of this building. I like industrial sites often the best the older they are, therefore this was a treat for me. A bit further on you come to a round church called Vera Cruz which was built by Templars and seems to be the only surviving example after the order was so cruelly pursued and its churches demolished. It used to host even a piece of the True Cross as the name implies. it is a very unusual building built around a round central round room that blocks the view across the church. This makes it quite hard to imagine how they may have used the space for services. A little further on at the tip of the Alcazar are two more monasteries that are more important for what they contain then for their architecture. But they are closeby and they make a nice finish to this walk along the river and the town hill. Just the changing views on the Alcazar make this walk alone worthwhile. While not all the mentioned buildings are equally important, at least three of them seem very essential for the city: El Parral Is certainly the most important monastery of the city beside San Antonio and its church is much more impressive than the latter’s. The church of Vera Cruz is so unusual in shape and interesting through its history that this could even make a possible candidate for a new inscription. The same seems true for the Mint since well kept industrial buildings of that age are both rare and highly valued. Why they were overlooked by the town committee and by ICOMOS and UNESCO seems quite a riddle. The only reasonable explanation would be that the city planned to launch another nomination. But of this I have never seen a hint and it seems unlikely since Segovia has already packed very various elements into its WHS. The core zone obviously just follows the old city walls and extends to the full length of the aqueduct but this does definitely not justice to the very special extra muros buildings. 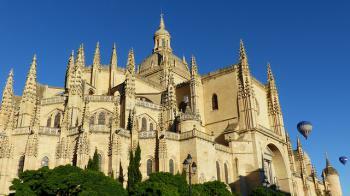 Along with Toledo, Segovia is routinely ranked as one of Spain's best world heritage cities. There is so much to explore here, it would be a mistake to not allocate enough time. The Aqueduct, Alcazar, and Cathedral make up the main coordinates you navigate toward, while exploring small medieval streets, ruined monasteries, and the city wall which surrounds you. The cathedral's upper stories require an additional ticket fee. For some this may not be worth it, the tour takes about an hour. 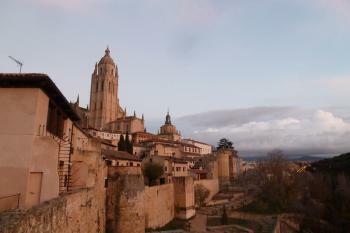 However, the last 15 minutes of the tour are particularly rewarding as you get expansive views of Segovia. 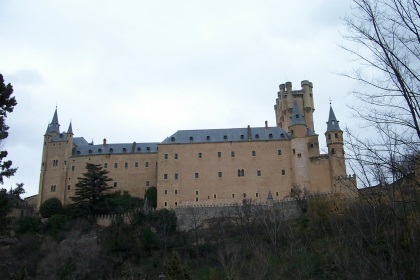 In addition, Segovia's Alcazar also provides different options for the visitor. One allows the visitor to explore the palace and artillery museum, while the others gives access the Tower of Juan II (you can choose full entry). After viewing the cityscape from the cathedral, I opted out of the another vista and just visited the lower section. The aqueduct is truly magnificent. I found it best in the evening before sunset. The swallows are a bit less active and the light more photogenic. There is far more to explore in Segovia than these 3 sites, but it would be a shame to miss any of these highlights. I visited this WHS in June 2015. I had been wanting to visit this site and I had included it in my personal Top 100 Unesco WHS Bucket List. Well, it certainly didn't disappoint. The main highlight is obviously the aqueduct which is really huge. Yet another Roman ruin/WHS you might think, but what I found special about this site is that it has become an essential part of the modern city. All the city revolves around this unique site and it lies at the heart of the city not at its margins like most other sites. I walked from the middle of the valley (where the aqueduct reaches 3-4 storeys high to the end the aqueduct which actually continues underground. The walk was pleasant and I would recommend walking up the few steps to the Mirador del Postigo to enjoy a great panoramic view of the city and the aqueduct with the Sierra de Guadarrama in the background. The cathedral can be viewed from Plaza Mayor as most other cathedrals in Spain. It reminded me of the Monastery of Batalha with its pointed spires and as you can see from the photo, every morning there are sunrise hot air baloon rides over the cathedral! Should I revisit I would love to give it a try. The third highlight of Segovia is the Alcazar which is worth viewing even from the inside. That said, I enjoyed myself more in the tranquil and pretty Poets' Garden nearby. Before heading back to the city centre, I saw the cathedral tower from another panoramic viewpoint, the Mirador del Museo de Segovia and then hiked down to the mysterious Iglesia de la Veracruz which is said to have belonged to the Knight Templars. I'm very glad to have stayed overnight as I got to visit the place in the morning before day trip coaches arrived from Madrid and then again in the late afternoon when most would have either left to Madrid or would have earlier to visit Avila. This is one of the best WHS Spain has to offer (at least from the 23 I've visited so far). Segovia is a great city to visit for several reasons, including its historic city walls, its imposing fortress that now houses a military museum, and its huge cathedral, one of the last Gothic cathedrals to be built at a time when Renaissance architecture was already widespread. The city's main claim to fame, and the reason it stands out from the many historic towns in Castile, is its fantastic aqueduct that runs right through the city centre. A masterpiece of Roman civil engineering, and one of the best-preserved ancient monuments anywhere, it served its original purpose until the 19th century. Segovia would be an easy day trip from Madrid, but I spent the night there and could enjoy its many sights for a bit longer. I think Segovia may be my favourite WHS in Spain of the 19 that I have visited so far. The mixture of an amazing monument, charming cobbled old town and a great selection of restaurants and bars made this a thoroughly enjoyable place to be based for a day. The aqueduct is rightly the most famous feature of the town, and its massive soaring presence is a great introduction to the city. I really enjoyed heading off in search of its start and then following it all the way into the heart of the city, which in-turn offers great views. The aqueduct isn't alone though in being a remarkable monument in the city centre. The first glimpse I had of Segovia was of the massive gothic cathedral, which is perched on a high point in the town and dominates the surrounding country side. It is nice inside, but I have seen rather a lot of Spanish cathedrals in the last few months so it felt like more of the same for me. The other stand out site was the Alcazar, a bizarre concoction of military stronghold and a faux gothic make over. It is well worth a visit even if it is just for the climb up and views from the tower which has a claim to inspiring Disney's Cinderella's castle. The thing I really liked about Segovia though was that these great attractions were surrounded by winding streets twisting up and down hill, littered with charming bars, some very tempting restaurants and then a handful of other impressive sights, such as the old synagogue and a healthy smattering of Romanesque churches. The whole lot was suitably thronged with people out for a stroll on a cold and sometimes rainy November night. Again demonstrating to me why I love spending my time in these charming European cities. In regards to the local delicacies I can thoroughly recommend the delicious Ponche de Segovia. My normally adventurous travelling pallet didn't venture into the main Segovian delicacy: roast suckling pig. It looked delicious, but I couldn't get the image of the row un-cooked piglets displayed in one of the windows out of my head. So instead I opted for a rather salty local goat cheese and some tastier duck ham. Vegetarians beware though Segovia was vying with Lyon for the most carnivorous city in Europe. There are infrequent trains from Madrid to Segovia, so it is worth looking and booking in advance, and as John Booth has said the cities two train stations are some way from the centre. The high speed one is in a the middle of a field a good 20 min bus ride from the centre, though it does have a café selling excellent Jamon Iberico to make the wait more enjoyable. However there are also buses from Madrid and Avila which could well work better for visitors. I really enjoyed Segovia, the sites really are impressive, but the relaxed wonderful old town is a great place to wander around and lose yourself by sampling the local delicacies. Segovia is probably my favourite Spanish WHS so far, high praise when it is competing with Barcelona's two impressive sites. Besides the aqueduct, the Alcazar and the cathedral, the churches of San Andres and San Martin are worthy of a visit for their architectural features. Travelling by train I found that there are two stations in Segovia, both quite far from the centre. The high-speed trains arrive at the Guiomar station (bus #11 to the aqueduct) while the slower, cheaper trains arrive at the old Segovia station (bus #8 to the Calle Colon). Segovia is one of those places in earth that you rarely hear about or simply ignore. Then you go to visit it and then you realize that Disney World and all the other "popular" places soo oftenly rubbed on your face are nothing but cheap-expensive nonsense places to be at. Segovia is nothing but living breath taking back-to-history monumental place that, unintentionaly gives you a lesson in history and most of all, GOOD TASTE. Thanks to all the people who lives there and welcome us with open arms and do it with a great dosis od sincerity and honesty. I used to live in Spain as a child. The last time I visited Segovia was in 1988. The aquaduct was the main thing that I remember. I vaguley remember an old story they used to tell us about how the aquaduct came to be built. If I can remember correctly, there was one stone missing for some reason that I can't recall(I believe the devil was in the story, but I could be mistaken). In any case, Segovia is a must see during your travels in Spain. 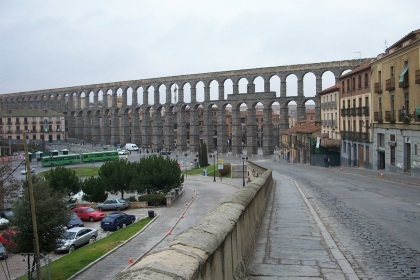 Seeing the Aquaduct in Segovia was one of my life's dreams. I was very impressed to see how well preserved it was inspite of its age. I visited Segovia back in 1981 and found the Segovians to be a very hospitable and friendly people. Physically, they reminded me a lot of the Italian people. Looks like the Roman genes are still surfacing. Visiting Segovia is a must when in Spain. Very nice place with very nice food. In fact, the latter does not surprises me since it is not so far from Portugal. 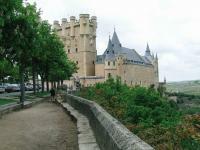 This place should be visited together with Salamanca and Avila. The aqueduct is amazing and the castle/palace is magical. I classify it as a castle/palace since I'm used to the portuguese castles that preserve their medieval look (Bragança, Guimarães, Almourol, Silves, Óbidos, Sintra, Lisbon, Leiria, and so may others). 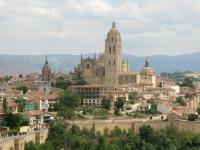 I visited Segovia with my daughters the summer of 2007. One of my daughters was studying in Madrid and she arranged for a day trip to Segovia by Bus. She wanted us to see the Cathedral as it was her favorite of all those she had visited in Spain. We could not find words to describe how amazing it was to view the Aqueduct. Lastly, we visited the Alcazar. My daughter suggested walking down the walkway to view the Castle from Below. From there you can view the base structures of the Castle that originate from a river. Truly Spectacular! We will never forget the memories we made there. Located about one hour by train from Madrid is one of the best locations for a daily trip. The town itself is absolutely great not only the old town. When i first saw the aquaduct as it pop-up behind a house i was really surprised and amazed. It is something nonforgetable. Walking just around the small streets of old town will give you the real sense of history. Catherdral from outside looks like from a fairy tale. Please dont miss the Alcazar which is small as it is a former castle on a steep rock, but it is very interesting and very nicely decorated. For military fans there is a small exhibition of artillery. 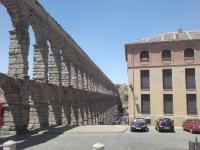 Segovia, with its Roman aqueduct and its medieval architecture, defintely ranks among the best WHS I've seen so far. Although the aqueduct and the cathedral were wonderful in their own right, the Alcazar was the highlight of my visit. It was a lot bigger than I had imagined with many interesting rooms containing armour, Flemish tapestries and the like. At the time of my visit, there was also an exhibition displaying restored paintings and sculptures that I found quite amusing. The view of the cathedral and the surrounding areas from the top of the tower of Juan II is magnificant (see picture) although the climb up to the top is unpleasant at best (definitely not for the claustrophobic). Segovia is also home to many ancient churches although most were closed on the day we visited (Monday). It is possible to combine a visit to this city with Avila (another WHS) on the same day. It was a little rushed but I managed to see all the sites I wanted. My wife and I just visited Segovia 3 days ago. We actually live in Valencia Spain, so it only took us about 5 or 6 hours to get there by car. We stayed just under two days and had a great time. The aquaduct was incredible, so was the cathedral and Alcazar. The cathedral took a few hundred years to build and when you are inside, you truly appreciate the architecture and the amazing attention to detail. We weren't supposed to take pictures inside, but couldn't resist. The food was great too. It was a wonderful experience. I was in Segovia for an exchange program. I couldn't have asked for a more beautiful city to be in. The aqueduct was amazing, the castle was gorgeous. There were so many interesting shops and restraunts. Segovia just radiated beauty and the people were so welcoming. The next opportunity I have, I plan to go back! My husband and I were in Segovia in June 2000. It is a truly magical place. We only stayed two days but managed to see all the sights as well as joining in with all the fun of a Spanish fiesta.The must sees are the Alcazar and the cathedral. The must feel is the aquaduct. So beautiful and amazing.We stayed at Hotel Infanta Isabel on the Plaza Mayor where everyone made us welcome. We loved this place so much we are visiting again this year en route to Portugal. Designed by Juan Guas: Cathedral: Guas worked on the original cathedral and its cloister and part of his facade was transferred to the new site and rebuilt next to HontaÃ±on's cathedral church a generation later. Linear inscriptions: The total "width" of the site consists solely of the aqueduct for around 12kms kms beyond the town centre of Segovia as far as the mountains where it commenced at the Fuente Fria.